MOSCOW (AP) Fans in stadiums about 1,000 miles apart – and millions watching on multiple screens around the globe – were transfixed on a studio outside Moscow where World Cup fates turned on nearly simultaneous video replay decisions. Iago Aspas had scored in the first minute of stoppage time Monday night, pulling Spain into a 2-2 tie with Morocco in Kaliningrad, but a referee’s assistant ruled he was offside. If the goal did not count, Spain would be in second place behind Portugal. 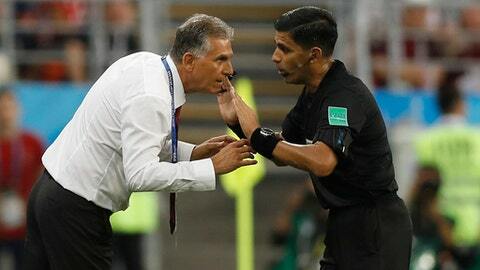 At the same moment, referee Enrique Caceres went to view his monitor in Saransk to determine whether Portuguese defender Cedric committed a handball when Iran’s Sardar Azmoun headed the ball down. Portugal was leading 1-0, past 90 minutes and into stoppage time. If Portugal won, it would finish first. If Iran were able to score on the penalty kick and somehow score again while Morocco held on to beat Spain, Iran would have shockingly won the group, Portugal would finish second and Spain’s World Cup would be over. When final whistles blew, Spain and Portugal – which drew 3-3 earlier in the tournament – were tied again atop Group B, but Spain got the top seed on the second tiebreaker, total goals, 6-5. Early in the second half, a video review led to a penalty kick for Portugal when Saeid Ezatolahi was judged to have fouled Ronaldo. There was minimal contact and Caceres originally waved off a foul. Ronaldo’s penalty kick was saved by goalkeeper Alireza Beiranvand. ”When there is a penalty, everything becomes more warm in the pitch. The temperature in my body it comes from 46 to 250, so understand why I need to take the jacket off,” he said. Soccer’s rules-making body started allowing experiments with video review last year and FIFA adopted it for the World Cup for the first time.